Madame Victoire, good, sweet-tempered, and affable, lived with the most amiable simplicity in a society wherein she was much caressed; she was adored by her household. 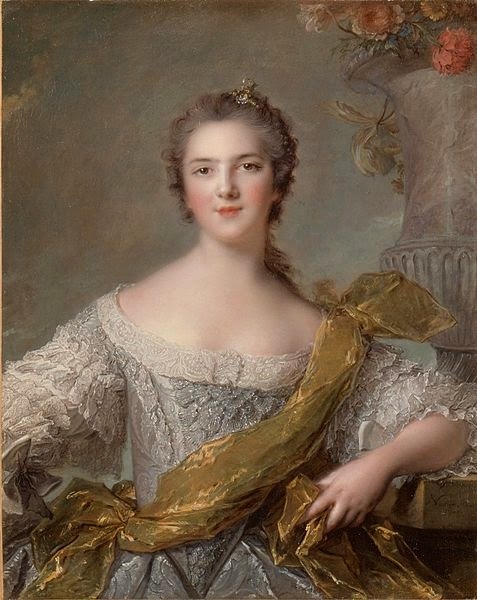 Without quitting Versailles, without sacrificing her easy chair, she fulfilled the duties of religion with punctuality, gave to the poor all she possessed, and strictly observed Lent and the fasts. The table of Mesdames acquired a reputation for dishes of abstinence, spread abroad by the assiduous parasites at that of their maitre d’hotel. Madame Victoire was not indifferent to good living, but she had the most religious scruples respecting dishes of which it was allowable to partake at penitential times. I saw her one day exceedingly tormented by her doubts about a water-fowl, which was often served up to her during Lent. The question to be determined was, whether it was ‘maigre’ or ‘gras’. She consulted a bishop, who happened to be of the party: the prelate immediately assumed the grave attitude of a judge who is about to pronounce sentence. He answered the Princess that, in a similar case of doubt, it had been resolved that after dressing the bird it should be pricked over a very cold silver dish; if the gravy of the animal congealed within a quarter of an hour, the creature was to be accounted flesh; but if the gravy remained in an oily state, it might be eaten without scruple. Madame Victoire immediately made the experiment: the gravy did not congeal; and this was a source of great joy to the Princess, who was very partial to that sort of game. The abstinence which so much occupied the attention of Madame Victoire was so disagreeable to her, that she listened with impatience for the midnight hour of Holy Saturday; and then she was immediately supplied with a good dish of fowl and rice, and sundry other succulent viands. She confessed with such amiable candour her taste for good cheer and the comforts of life, that it would have been necessary to be as severe in principle as insensible to the excellent qualities of the Princess, to consider it a crime in her.